You can file for divorce in Washington State if either you or your spouse is resident of Washington or is a member of the military stationed in Washington. Review and sign the documents. File the Petition for Divorce and related documents with the court clerk. Division of property, child parenting plan (including child support, visitation and custody), alimony, and more are covered. You'll receive all of the required Office Administrator of the Courts forms--completed and ready-to-file. Your documents will be accepted by the court or your money back. You do not need to appear in court in Washington state to complete an uncontested divorce, you may file your divorce by mail. We provide you with completed documents and instructions for completing your divorce by mail. 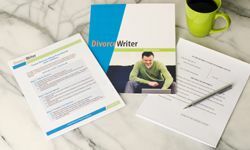 You have qualified to use DivorceWriter to complete your Washington divorce papers online. Select "Continue" to start the interview.